APRIL color of the month! Yes! April! Spring is now official! The cottage is back open, I haven’t been yet but soon, soon! I can’t wait for some quiet island time, bird watching, and starting the garden there, and the garden here at home for that matter. Plenty to do in the meantime. April is a busy month traditionally with family activity, work, and the commencement of rummage sale season. Spring is a great time to dig deep as we renew and refresh from the winter. With my upcoming birthday, giving me my last year before I hit the next decade, and going into my 10th year in business I’m digging extra deep these days. SO, I give you red this month, an emotionally intense charged color. 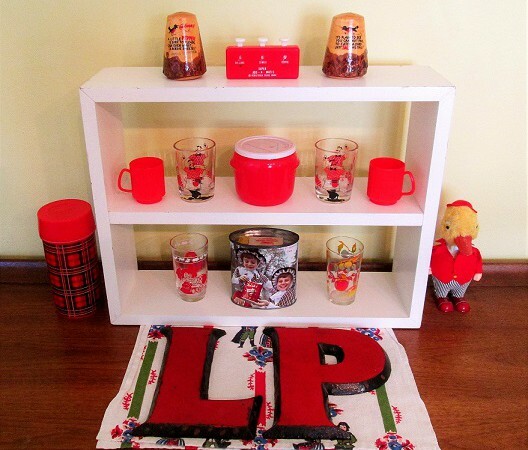 Fave Vintage: the kitschy wood salt and pepper bird saying salt and p’s, add-a-matic, tiny play cups, red honey jar, Hazel Atlas shot glasses, juice glasses, Welsh candy tin, plaid thermos, wind up ducky-too cute when he spins his cane! cast iron initials- bought them at a flea last summer, looked down there were my initials, it was a sign from the flea gods. All anchored by a sweet vintage tea towel. 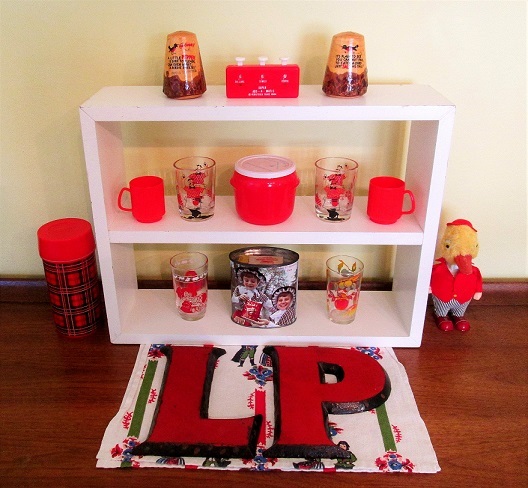 Head over to the vintage shop as usual to find most of these treasures! 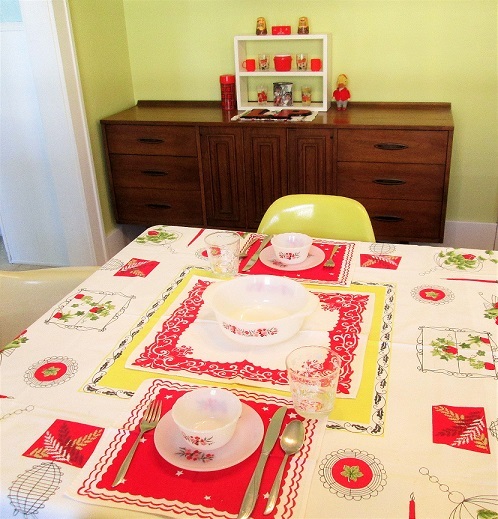 Fave Vintage: Let’s start with linens! This new to me vintage tablecloth is going into my personal collection for now with its cool plant motif, the red star napkins MINE, and the napkin in the middle, yep keepin it! Now for you: vintage glasses, I love this shape for wine, and these Fire King primrose pieces are in shop ready for your collection or own setting! Proving once again a few colorful pieces make a great table setting! BOOM!